Five years of advanced satellite images show that there is more artificial light at night across the globe, and that light at night is getting brighter. The rate of growth is approximately two percent each year in both the amount of areas lit and the radiance of the light. An international team of scientists on Wednesday reported the results of a landmark study of global light pollution and the rise of light-emitting diode (LED) outdoor lighting technology. The study, published today in the journal Science Advances, finds both light pollution and energy consumption by lighting steadily increasing over much of the planet. The findings also challenge the assumption that increases in the energy efficiency of outdoor lighting technologies necessarily lead to an overall decrease in global energy consumption. The team, led by Dr. Christopher Kyba of the GFZ German Research Center for Geosciences in Potsdam, Germany, analyzed five years of images from the Suomi National Polar-orbiting Partnership satellite, operated jointly by the U.S. National Aeronautics and Space Administration and the National Oceanic and Atmospheric Administration. The data show gains of two percent per year in both the amount of the Earth’s surface that is artificially lit at night and the quantity of light emitted by outdoor lighting. Increases were seen almost everywhere the team looked, with some of the largest gains in regions that were previously unlit. The results reported today confirm suggestions in earlier research based on data obtained with U.S. Department of Defense meteorological satellite measurements going back to the 1970s. However, the better sensitivity of Suomi’s cameras to light on the night side of Earth and significantly improved ground resolution led to more robust conclusions about the changing illumination of the world at night. The study is among the first to examine the effects, as seen from space, of the ongoing worldwide transition to LED lighting. Kyba’s team found that the energy saving effects of LED lighting on country-level energy budgets are lower than expected from the increase in the efficiency of LEDs compared to older lamps. LED lighting requires significantly less electricity to yield the same quantity of light as older lighting technologies. Proponents of LED lighting have argued that the high energy efficiency of LEDs would contribute to slowing overall global energy demand, given that outdoor lighting accounts for a significant fraction of the nighttime energy budget of the typical world city. The team tested this idea by comparing changes in nighttime lighting seen from Earth orbit to changes in countries’ gross domestic product, or GDP – a measure of their overall economic output – during the same time period. They concluded that financial savings from the improved energy efficiency of outdoor lighting appear to be invested into the deployment of more lights. As a consequence, the expected large reductions in global energy consumption for outdoor lighting have not been realized. Kyba expects that the upward global trend in use of outdoor lighting will continue, bringing a host of negative environmental consequences. “There is a potential for the solid-state lighting revolution to save energy and reduce light pollution,” he added, “but only if we don’t spend the savings on new light”. IDA has campaigned for the last 30 years to bring attention to the known and suspected hazards associated with the use of artificial light at night. IDA Executive Director J. Scott Feierabend pointed out repercussions including harm to wildlife, threats to human wellbeing, and potentially compromised public safety. IDA drew public attention to concerns associated with the strong blue light emissions of LED lighting as early as 2010. The VIIRS instrument used in this study is relatively insensitive to blue light. White LED light is rich in blue colors, and so partially escapes detection by VIIRS. That can lead to an underestimation of the problem of light pollution. Blue light is also more efficient at scattering in the Earth’s atmosphere than light of other colors, so the glow of Earth’s cities may not be accurately seen by Suomi. The conversion of outdoor lighting from older technologies to white LED may therefore result in cities becoming apparently darker over time, but Kyba cautions this is not necessarily true. “Many large cities we looked at showed decreases in brightness in the city center, but increases in outlying areas,” Kyba observed. 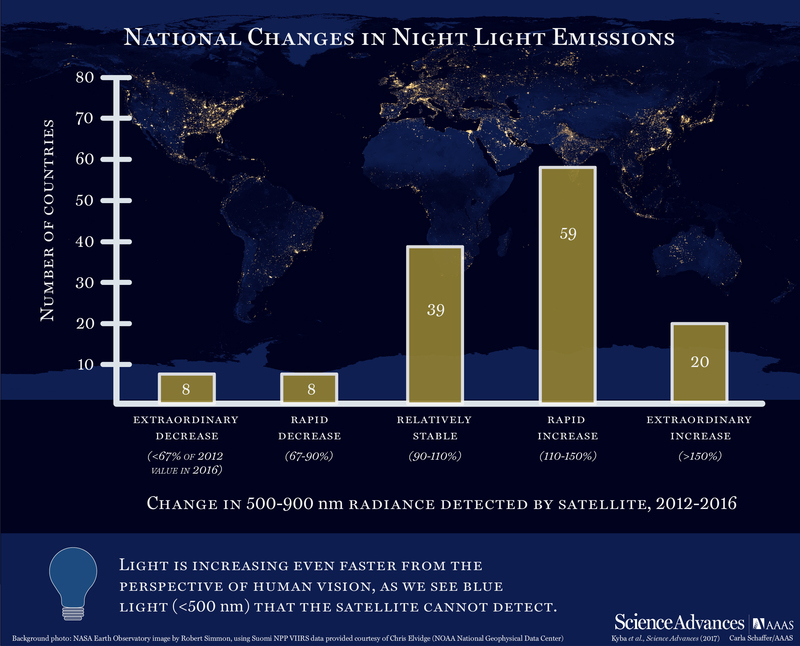 “These decreases can often be directly attributed to replacement of older lamps with LEDs.” Kyba hopes that future Earth-observing satellite missions will overcome this deficiency and lead to better characterization of how our world uses artificial light at night.